Nir Sofer is a prolific developer of great, free Windows utilities. As I blogged here in December 2014, he bundles his most popular tools into a runtime collection called NirLauncher. Just recently, I noticed that numerous elements in my copy of NirLauncher have been updated, so I started looking into what might be involved in updating them. In the absence of a built-in update facility for the program (are you listening, Nir?) the best approach to dealing with ongoing updates appears to be something in the “remove and replace” line of system maintenance. That is, the easiest way of handling NirLauncher updates appears to be to overwrite the entire previous version with the most current version. At 23.22 MB, it’s not even a terribly large download to make by modern standards. 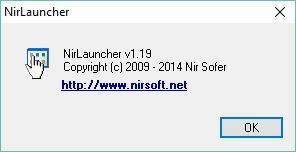 Best practices would seem to dictate that getting into a monthly cycle with NirLauncher is a good idea, since nary a month goes by when Mr. Sofer doesn’t update at least a couple of its constituent tools. By checking the Launchpad tool, I discovered that it itself hasn’t been updated since 2014, as the copyright date attests. The utilities it drives get updated all the time, though. In looking at the underlying file structure, you could indeed grab only updated utilities and extract them into the right directories instead of doing a wholesale remove and replace. This would mean checking the updated item, and determining if it comes in both 32- and 64-bit versions. The 32-bit versions go into the root …\NirSoft directory, along with help files and supporting components such as .inf and .cfg files where applicable. Their 64-bit counterparts go into …\NirSoft\x64 instead. But the more I look at this and think about the work involved, the better I like the brute force approach. Sofer recommends keeping NirLauncher on its own dedicated UFD (USB Flash Drive) anyway, so what could be easier than blowing the old directories away and replacing them with the latest version? Not much, as it turns out, and that’s the way I do it now. Maybe you should do the same thing, too.